Lovely newly refurbished executive villa on exclusive country estate close to Disney(10 mins), Celebration 3 miles, Champions Gate Golf 2 miles(Greg Norman) What makes our home unique?? We have planted small trees in the back garden between our house and our next door neighbours on both sides so we have total privacy when sitting on our pool deck and lounging in the spa or pool.. It is an oversized plot with large extended lanai covered pool area(the largest in the vicinity) in prime location backing onto peaceful lake setting. Two master suites (king and queen), 1 double and 2 twins. 3.5 bathrooms. Guests have full use of our home and all of the amenities including pool, hot tub, BBQ. The Home has a full set of bed linen and towels. In addition there is a set of outdoor towels in the utility room for pool use. On the pool deck there is an outdoor dining area under the house roof with a fan to cool you in the evenings. There is a second table on the extended pool deck where you can have breakfast in the sun! The house has a full set of poolside tumblers and plates. Our home has a manager on call who will be available should you have any questions or queries. His number will be provided to you when I give you directions. It is also in the guest services book located in the house. In addition, we provide a high chair, travel cots and stroller for infants. Guests are required to sign a rental contract at time of booking. Guests are required to sign the contract prior to directions being provided. Our home is at the back of the subdivision away from all noise and traffic. It is very peaceful and tranquil. Our home is not overlooked front or rear. We extended our pool deck to provide a large sun deck. The area has little traffic and outside the subdivision several of the Polk County roads have cycle lanes. A range of bikes are located in the garage for guest use. Shops: The area is well serviced with shops, Publix, 7 Eleven, CVS are all located within 1.5 miles at the junction of Lake Wilson Road and CR 532. These shopping areas also include Papa John’s, Pizza Hut, Dunkin Donuts, Chinese, Subway, McDonalds fast food outlets as well as hair and nail salons. Champions Gate is close by (2.5miles) with its golf courses. There are two Greg Norman courses here to choose from depending on your skill levels. The club house provides an excellent lunch. In addition, there is another golf course in Reunion, Kissimmee which is only a short drive from our home (2 miles). 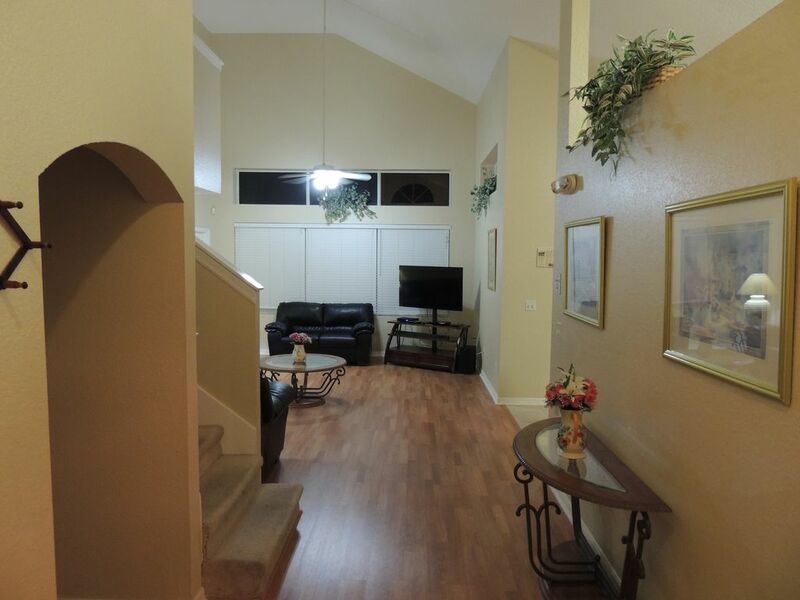 Our home is 30 minutes from McCoy International Airport and is easily accessed via 528 and I4. We will provide directions closer to check in time. Please note 528 is a toll road so make sure you have US$2/3 in change. Our house is located off I4 which is the main route for getting to all the main attractions Magic Kingdom, Epcot, Animal Kingdom Hollywood Studios, Blizzard Beach (Exit 62), Typhoon Lagoon, Disney Springs (Exit 67), Sea World (Exit 71), Aquatica (Exit 72), Kennedy Space Center (Exit 72), Universal (all parks) (Exit 75). I remember seeing our lovely home for the first time and falling in love instantly! We had spent days looking all around the area and saw lots of houses but this one was just special. We wanted a home where all our family could enjoy our vacations and also rent out to other guests. That was over 14 years ago now and we have upgraded our home several times since. We all really loved the size of our home – plenty of space for everyone all together and to have ‘me time’!! The large pool and separate spa was a very exciting prospect but with our large family, we knew we needed to extend it so we could all sit in the sun and have plenty of room. We did that a few years later and now have sun on the deck all year round – it is the largest pool area in the vicinity. The icing on the cake was the privacy of our pool area which backs on to the lake. We are not overlooked front or back so can sit out all day long in a very peaceful place which is seldom available in a property so close to Disney (10 mins). I love the evenings sitting in the spa watching the sun go down behind the trees – pure heaven !!! all local calls free within US and Canda apart from information calls. Should the temperature drop the house is heated by switching the air conditioning to heat and our home will rapidly warm. All beds have a full set of bed linens and are made up upon arrival. Additional bed linens and blankets are stored in the closets and upstairs in the linen closet. A large washing machine is provided for guest use in the utility room. A large clothes dryer or guest use in the utility room. Complimentary Wi-Fi is available for guests with fast broadband access. A PC is also available for guest use. A full set of towels and wash clothes are provided for 12 guests. Additional towels are available upstairs in the linen closet. There is also a separate set of pool towels in the utility room. The living room is furnished with multiple sofas one of which can be used as a bed. A large LED TV, Cable TV and DVD player are provided. A selection of books, DVDs and board games are also available. Dock also provided at end of garden where lake is. Fishing rods are available in the Garage but a local permit is required. Champions Gate two Championship Courses are 2 miles from our home. In addition Reunion Resort has another golf course.